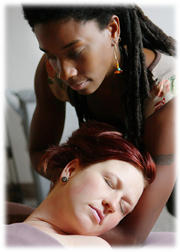 Therapeutic massage has been shown to be highly effective in reducing the shock and trauma following a motor vehicle accident (MVA). Massage can be an extremely beneficial therapy to ease physical pain, to manage emotional stress, and to nurture oneself through the difficult times following a car accident. Indeed, massage is a basic form of healthcare. Massage can be extremely effective in reducing pain after a motor vehicle accident, and in preventing life-long pain from unresolved injuries. This is not a complete list. Contact Harmony Massage or call your car insurance company to determine your eligibility for massage following a motor vehicle accident. A prescription is required from a medical doctor, chiropractor, or nurse practitioner before starting treatment for therapeutic massage. Please contact us if you need assistance getting a prescription for massage. We are happy to bill your car insurance company for your massage. Please bring your claim information into our office for your first visit, and we will submit all the necessary paperwork for each visit. Click here for more information about health insurance. Copyright 2012 Harmony Massage. Design by Rainsong Design.